Although the state-controlled Balkan corridor is closed since March, hundreds of people still travel across the Balkans towards central Europe. People cross from Greece through Macedonia or from Turkey through Bulgaria to Serbia, where around 300 people arrive every day. After a few days in Belgrade, most people continue to Subotica, a small city close to the Hungarian border. 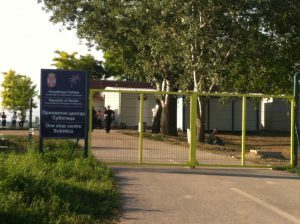 Despite the fence along the Serbo-Hungarian border, there are several possibilities to cross from Serbia into Hungary. There are three camps in the area. One is a state run “one-stop-centre” in the outskirts of Subotica. The other two are self-organised camps right at the transit-zones. 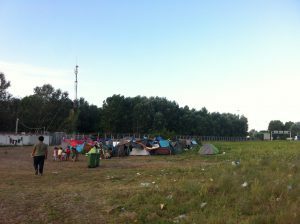 Around 15 people per day are allowed to cross legally into Hungary from each camp at the transit-zone. Many people try to cross into Hungary on their own during the night to avoid the long waiting period and uncertainty in the transit zone. The unauthorised ways are highly frequented and many people manage to transit Hungary and continue their journey. However, the Hungarian police and fascist civil defence units control the Hungarian border tightly. They systematically push refugees back from Hungary to Serbia. 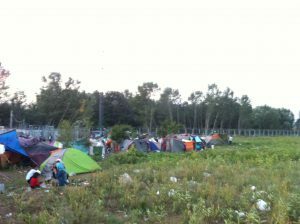 In the last weeks, these pushbacks increased, leading to a larger number of people stuck in Serbia. There are many people reporting violence from the Hungarian authorities during the pushbacks. For more information, see previous report on violence during pushbacks from Hungary. I crossed with my husband and our four small children from Serbia into Hungary through a small hole in the fence. We had already walked for several kilometres when the Hungarian police stopped us. They sprayed pepper-spray at us, even at my small children. They put us all into their car and we had to exit back through the same hole we entered. It was 3am in the morning. We slept next to the fence on the bare ground that night. The next day we went to the One-Stop-Camp in Subotica. At the state-run „One-Stop-Centre“ people can stay and rest for some time. It has a running infrastructure with showers, tents and electricity. However, people only receive bread with tuna or sardines. 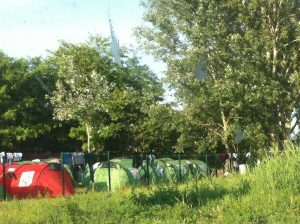 Due to the larger number of pushbacks from Hungary, the camp is over-crowded at the moment and people have to sleep in tents outside. The Hungarian authorities regulate the entry at the two transit zones. 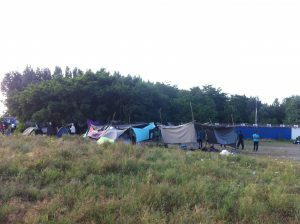 Once again, the blocking of the border and the attempt to strictly regulate people entering Hungary causes miserable situations. 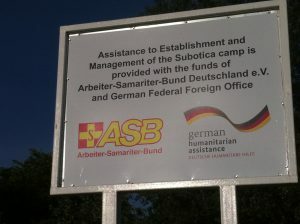 During the last months, around 150 people were staying in each transit camp. They had to wait between two weeks up to one month until their turn to cross. New people who arrive have to put their name down on a list and wait until their name passes to the top of the list. 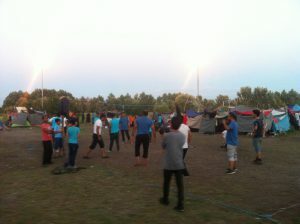 One person from the camp is made responsible for the list and then hands the list over to the Hungarian authorities. Families are prioritised and consequently have a shorter waiting period, whereas single men often wait for a longer time. Moreover, single men are often detained for up to 28 days. 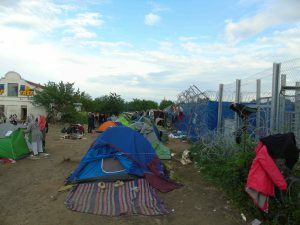 Therefore, there are mainly families staying at the transit camps, as well as single men who have lost their strength or are fed up with the police violence and pushbacks from Hungary. Hungarian police patrol the border, standing and walking on top of the containers that form the border crossing, surveilling the residents of the camp from above. The conditions in the makeshift camps are precarious. The provision of basic items is insufficient. There are no showers, only one water tap and a few Dixi toilets. 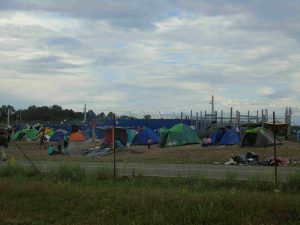 Food is provided by the Hungarian side, because the camp is set up on a few meters of Hungarian soil, although behind the fence. The food provided is again mainly bread and tuna or sardine cans. The UNHCR, IOM and a few other NGOs are present during the day until around 4pm. They distribute blankets and some clothes. Q. who has been staying in the camp for 10 days with his wife and friends explains with a smile: „I was a garment shop owner in Masar-E Scharif. At home, I owned more than a thousand T-shirts. Now I have to queue for an hour to get a single Shirt.” A small number of local and international volunteers hand out food and clothes in Kelebija as well as at the bus stop in Subotica when people arrive. However, tents are not distributed. Therefore the people who did not bring their own tents or can take over the tent of people who crossed before them have to build some sort of shelter with fleece blankets. The Kelebjia transit zone is located next to a smaller official border crossing. The conditions are miserable, similar to the Horgos transit zone. In comparison, Kelebija is easier to access via public transportation and closer to the next shop, where people have access to Internet and can charge their phones. However, it is very close to the street where huge trucks pass. There is hardly any infrastructure and a big lack of basic food and hygienic supplies. The trash piles up right next to the tent where people sleep. The Horgos transit zone is located on a field at the border fence next to the official Röskze-Horgos highway border crossing. 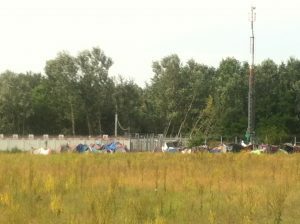 The informal camp is very difficult to access. Those who want to reach the camp have to walk along the highway and on a small dirt road towards the border crossing. Due to the remote location of the camp, people have to walk for half an hour along the highway to reach the next supermarket to cover their basic needs themselves. I am here with my wife and my four children, the youngest is one year old. We arrived here yesterday from Belgrade. We are sleeping on the ground without a tent, without a mattress, just one thin blanket on the floor. Here, my children cry for food and I do not have enough to give to them. I do not have money to buy food from the gas station or from the supermarket. In Afghanistan I had a house and a job and a car, now I have nothing. The situation here is worse than at home. During the last days, the situation became even more precarious at the Horgos-Röszke camp, as the number of people arriving increased substantially. On the 4th and the 5th of July around 200 new people arrived. 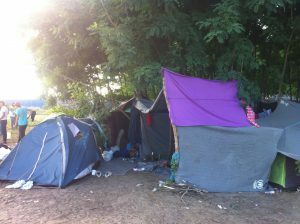 This means that the number of people staying in the makeshift camp doubled. 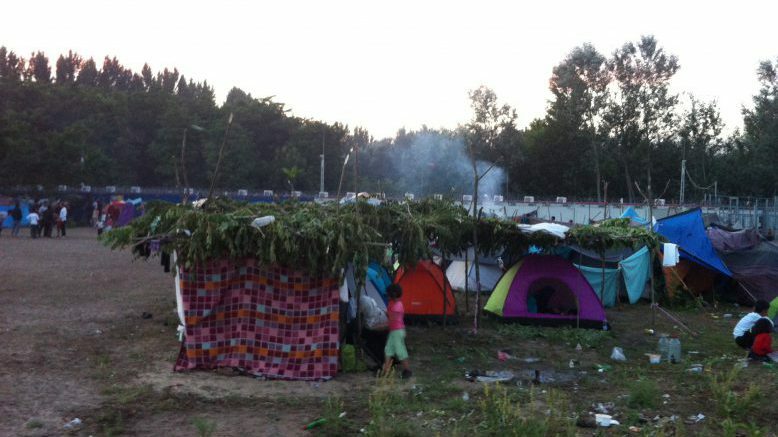 Despite the stark lack of material provisions, people in the camp organise themselves to build basic shelter for everyone, as well as spaces of comfort and solidarity. „We also like to help each other here“, W. from Kabul explained. „Therefore, we set up our own distribution structure. I spent the entire day distributing goods. We also store some of the goods available, and give them out to people who arrive in the evening or at night, when all the official organisations have left.“ F. and her cousin M. from Kabul added: „We have been here for a long time now. We have inherited these tent structures from the family who stayed here before, and we continue to build things to make the place a little bit nicer, improvising with what we have: Now we have tents to sleep in, an area to sit and talk, a hole in the ground to store food, a place to cook on the fire and a little washing area.“ In the evening, when the temperature has cooled down, half the camp is playing volleyball and football on the fields they have set up.